CHRISTMAS 1995. Jocky Wilson is boarding a bus in Newcastle. He has left his house in Wallsend with a car on the drive and he is turning his back on the game that made him famous to head back to Kirkcaldy, to sanctuary. Things don't quite work out. Five years on, a council flat recluse, Jocky is in a private hell of diabetes and depression and the whole of darts is suffering withdrawal. "I've got lovely memories of him," says Eric Bristow for the sport's high and mighty. "I miss him. Darts misses him - the game needs characters like Jock." Lower down dartdom's ladder the regrets are likewise tinged with warmth. Mention Wilson's name in Uncle's Bar and a few of the regulars edge closer to tell some happy tales of Jocky on the oche. This pub was once called the Lister, and on a good day years ago, Jocky reckoned there was "a wee bit of the hustler atmosphere that Minnesota Fats and Paul Newman would have appreciated". He learnt the game here - stung in his first game by a grannying from "Ginger" Snowden - and he played for any number of the local teams. Now with the dartboard hidden away in the corner and Kirkcaldy's darts league disbanded, the game is dead on its feet in the town. "All the good players are away to Glenrothes," reckons Jocky, as he squints towards you across the hallway of his flat. There's not many speak to him these days. His wife, Malvina, usually takes the calls, and "No," she tells allcomers, "Jocky won't talk." Today it's a little different. The man of the house answers the door, his Jack Russell terrier scampering round his feet. Jocky is still defiant. "I just want to be left alone," he pleads from behind his big, square glasses, "because all they write about me is crap, and I don't want to read about that. That's it in a nutshell. I'm sorry. I don't want to shut the door in your face." And if you protest that his friends are missing him, he's quick to cut you off. "Aye, but it's all over and done with now. I don't even go out. Only to the doctor. I'm sorry, but good luck to you." Jocky wasn't always quite so shy. Fuelled by lager and vodka, he threw himself from novice to World Champion in 12 years. Once, when a social security official saw him on the television winning money at the Butlins Grand Masters, he had his dole stopped. But he brought record crowds to darts, and in these parts of Fife he filled the pubs as folk crowded in to watch his big wins on television. When Jocky beat John Lowe for that first world crown in 1982, you'd better believe they were dancing in the streets of Raith. The image of Jocky was hung over Kirkcaldy's Mercat centre and Bill Hill penned a verse: "He's sixteen stain of fat and pain/ When he steps up to the oche/ When he throws the spears you can hear the cheers/ For Fife's wee hero Jocky." For Jimmy Skirving, an old mate from Harrow's Bar, the pleasure was more immediate. He was there for the double ten that won the final. "Jocky came straight off the stage and gave me his darts - I've still got them. He just said, 'I've done it'. He gave my son the dartboard." Others talk as warmly about Jocky, but even when you stand outside his door and tell him so, he won't respond beyond the hint of a toothless smile. "Ach, I enjoyed it while it lasted. But that's life, eh? You get knocked for six, and then that's it. I couldn't do it now." But then suddenly he raises his voice against the world. "I could have still been playing - I just didn't have it in me. "Turning up at a venue and taking good money. Maybe my mind wasn't right, but I just couldn't get out of there quick enough. That's not on. "And playing on TV - ach - I didn't have any go in me. I said to myself 'I'll just have to get out of this because I can't handle it any more'." The drink was part of it. Towards the end, suffering already from the diabetes, he was hospitalised after a drinking binge. That event came as a terrible blow, for reasons that the commentator Sid Waddell makes clear. "He couldn't be Jocky Wilson without a lot of drink," Waddell believes. "He couldn't be the player he was. Unfortunately, the ten pints of lager and the three or four vodkas are going to kill you if you do it every night. I think, psychologically, he realised that, and quit when he was 45." It's a tough old sport for the teetotaller. Waddell has got many a tale from days on the road with Jocky and the two remain good friends. "I remember, at seven in the morning, drinking water from a Lucozade bottle and Jocky said: 'Is that gin or voddy?' I said: 'If you've had a bit to drink the night before, you should rehydrate'. He said: 'My granny told me the English poison the water.' So the only thing he'd drink was Fanta." The stories might raise a smile, but these days they're no laughing matter for Jocky himself. "When I was brought up with the darts, it was drink and darts, drink and darts," he tells you, keeping the door half shut. "When you have a few too many you do a lot of stupid things, but you don't think you have. I can understand now that I'm on the wagon, but at the time you never realised. "They might like a pint now, but they know when to stop. I just kept going. I was always pissed by the end of the night. I enjoyed it while I was there. It got me out of a hole at the time. That's life, eh? I didn't look after my money, but that's another story." That last is certainly true. Having dragged himself off the dole queue, Jocky wasn't always the luckiest with advisors. His first agent was Ron Clover, of Fourleaf management. In 1983, Jocky wrote: "Ron is much more than a manager; he is a friend. Thanks to him I do not have to worry about deals with sponsors, paperwork or tax." Some friend. Within two years, his manager was sueing for a share of the earnings. Jocky countered he had signed for Clover when he was drunk, but the judge found for the agent, a decision that ultimately cost John Thomas Wilson around £80,000. Later, when the Inland Revenue claimed a further £27,000 in back tax, Jocky was in real trouble. No longer earning huge sums from tournaments, he was making shift with a couple of exhibitions a week, for maybe £300 a night. Take out instalments to creditors and a hefty budget for cigarettes and beer and there was precious little left. He was declared bankrupt in 1997. Financial problems were only part of it. Jocky suffered other pressures in the early years. For a start there was all that palaver over Malvina, when the player and his wife found themselves abused by their patriotic neighbours, for the accident of her Argentinian birth. "I got stick through that with the Falklands War," he growls. "She's lived here since she was five years old. And they made a fuss of that. It's wrong. It's nothing to do with anything." And here he will concede the help of friends, such as Jimmy Skirving and Sid Waddell. "Well, they knew," he agrees. "I mean, I've never been politically minded or anything, but a war's a war, eh? That's life." And then he goes on: "Oh I've seen the world and that. I've travelled. And I'd have probably ended up in the jail if I hadn't because times have been hard here, you know. I don't miss it though. I'm glad I'm out of it, because of the way my mind was at the time." It's impossible not to ask whether the problems were all down to booze. Jocky pauses. The Jack Russell at his feet has started to growl and he silences it by swiftly caressing the dog's backside with his foot. "The drink came into it. But I wouldn't say it was just the drink. I just wasn't able to do it. I didn't have the energy." In truth, depression had set in long before his playing career had finished and he was leading, he says, a kind of Jekyll and Hyde life. Then he adds insistently: "But, still, I did a lot of good for people when I was at the top, a lot of charity stuff. Nothing's said about that." He's wrong on that score. His friends remember. Skirving can vouch for the player's generosity. "You could always rely on him," Jimmy says. "See the amount of trophies he won and gave away - I can assure you Jocky was taken a loan of quite a lot. Once he won a holiday and a nest of suitcases. He never got home with either - he sold the holiday for 50 quid and the cases for a tenner." Somehow all the prizes were ephemeral. As long as Jocky could relax and recharge his batteries, he was happy. His most treasured assets became the fishing boats he bought with his winnings and if he could get away for a few days, he was more than ready for the battles at the oche. Bristow can remember a televised international from Livingston, when he was called to the stage to face Jocky in a singles game. "As I climbed up, Jocky kicked me straight on the shin. The officials pulled us apart and I had to climb up, live on TV even though I could feel my leg bleeding under my trousers. "Jocky came up behind and I had to shake hands in front of the cameras and smile at him." He laughs craftily: "All I wanted to do was strangle him." And now, well beyond the glare of TV lights and smiling in the gloom at some memory of his own, Jocky can reflect on the genuine friendship the two men shared. "I liked Eric, if you want the honest truth. I could trust him. No matter what the papers thought about cats and dogs, we got the wages." They brought the punters in, you could say. "That was it. But no matter what, we still wanted to beat each other. Wind-ups and all that. But Eric's got a heart of gold, and I mean that." And yet it's Bristow, who loudest of all, has urged his friend to end his self-imposed exile. In the gloom of the hallway, Jocky still won't entertain the notion. "If you've not got it in your heart, what's the point? And I've not. Seriously, I've not. If I went back to darts, I'd end up drinking again, that's a cert. And I'd end up - bump. I'm better out of it. I just can't handle it. "I liked a drink - Eric's probably the same because we all came up the same way. They like a drink, like's of the older school, but the younger school, they don't drink much. In fact, they're not very entertaining if you want the honest truth." But surely, whatever his troubles with girls, that Phil Taylor's a good player. "Oh excellent, excellent. He's brilliant. It's a shame what's happened to Phil because I like him and all, by the way. I still think he was set up. "But that's it, eh? I don't want to talk really." And, at last, from behind the neat little door with its silver nameplate, J Wilson emerges to shake my hand before he disappears. Jocky Wilson is a gentleman. Jocky is a true character. Michael Sheen, come on you want to play him next, you know you do! What a great read - Jocky will always be a true legend - A phrase which is over used at the moment, but truly deserved for Jocky. Great idea for Michael Sheen to play him in a film though !! jocky wilson = greatest darts player of all time. Sad news. My son Michael and I were on the way to Wembley on Sunday when we heard that Jocky Wilson had died. I was driving so Michael twittered some words in response. A BBC reported contacted me for an interview but it was during the match and he couldn’t hear me. Someone twittered that he went out on treble 12 and double 13 but I had to reply and put him right that Jocky would have gone out on treble 10 and double 16. 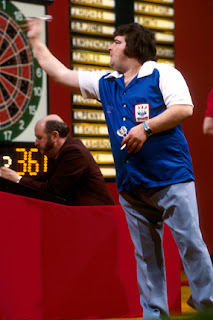 I remember that Jocky was on a televised 9 darter and just wired double 18 with his 9th dart. As I recall, it would have won him a house and eternal fame as the first person ever to hit a televised 9 darter, That fame of that everlasting record of course was subsequently achieved by John Lowe. Funny thing is that I have only ever hit one 9 darter myself and that was about 35 years ago in Kirkcaldy ....against Jocky!. Dave Whitcombe was right, that 'falling off the stage incident' didn't happen (it nearly did but not quite, so people exaggerate). Mind you I saw him fall over a few times in the old days. And one other thing that people won't know is that the first time Jocky appeared on TV he was wearing a pair of my shoes. He came into the pub a couple of nights before and showed us that the shoes he was wearing (his only pair) both had great holes in the soles and so did his socks as you could see his bare and rather black feet through the holes, bless him. I said that it wouldn't matter as nobody would see the soles of his shoes on TV but he was worried that something might happen (like him fall over) and the whole world would see how poor and underprivileged he was (he was unemployed at the time and had been for some time). I lent him a pair of decent black shoes and he did wear them even though they were one or two sizes too big for him .. but the good news is, he won! I read the write up in the times today and, as expected I suppose, it described some of the down side of his time of fame and it brought it all back to me, and more. The general public will probably only remember the fun side of his antics on TV etc so I will try to keep to remembering him for those times. After all he did bring something new to the televised sport at the time - fun and laughter, be it a little over the top sometimes. RIP wee man. From Alan W, an old team mate and sometimes doubles partner back in Kirkcaldy in the seventies. Faroe islanders ask: Where's Primark?